Gov. Rick Perry's Texas Highway Patrol just received their first-of-six armored "Shallow Water Interceptor" gunboat. 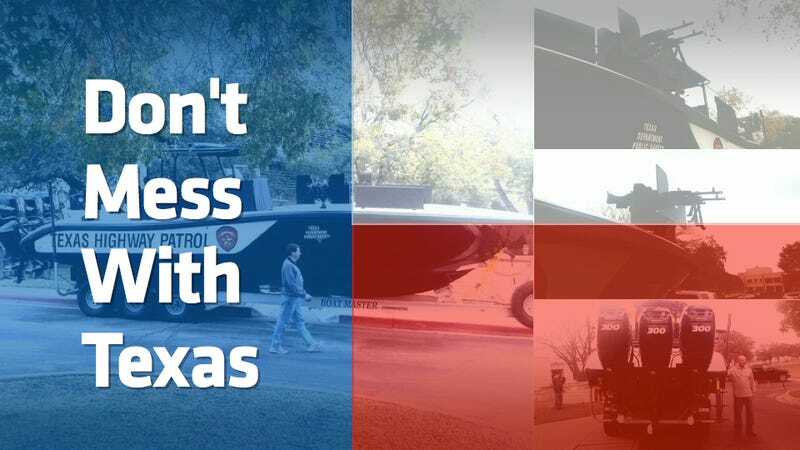 Why does the Texas Highway Patrol all of a sudden need a fleet of armed-to-the-gills gunboats? For the same reason Texas usually arms itself up: Mexicans. International waters between Mexico and Texas are a hotspot for drug and human trafficking, so the state's police force (technically the Texas Department of Safety Highway Patrol) is the agency typically tasked with these sorts of interdictions. In 2010, for instance, a jet skier on Falcon Lake was mistaken for a drug gang spy and murdered. In typical Texas fashion, the boats are over-the-top and slightly insane. The Shallow Water Interceptor is an armored 34-foot speed boat powered by triple 300 horsepower engines giving it 900 horsepower total. For armaments there are five static mounted M240 light machine guns, a pair of Barrett .50 sniper rifles. There are also various rifles, submachine guns and grenade launchers on-board. Just in case. That they're boats with "Texas Highway Patrol" written on them is hilarious but appropriate. The gunboats cost $580,000 a piece and will be named for DPS officers who lost their lives in the line of duty. Calling these "patrol boats" is kind of an understatement. This is the start of a Texas Navy, which is not without precedent. Texas was once its own republic with its own fairly successful Navy. Twice in Texas history a seaworthy fighting force was put together. The First Texas Navy purchased four poorly armed schooners, which they used to keep General Santa Anna's army at bay and unsupplied long enough to win independence. The Second Texas Navy was slightly better prepared when it faced off against the Mexican Navy to maintain its independence and has the notable distinction of being one of the only sail-powered fleets to ever fight a steam-powered force to a draw. When the Second Texas Navy returned, President Sam Houston accused them of being pirates for engaging in battle without his command, but their antics were still rewarded with a place on Texas currency. Seriously, do not mess with Texas. Because they will kill you with a gunboat.